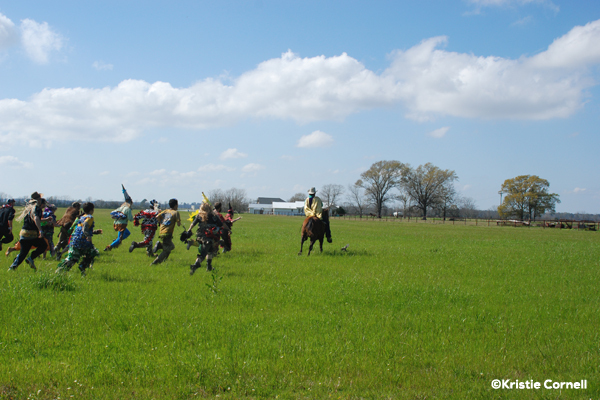 Most people recognize Mardi Gras as parades, masked balls and other urban events but in Cajun Country there&apos;s a unique side of Mardi Gras that takes place in the countryside and dates back centuries. 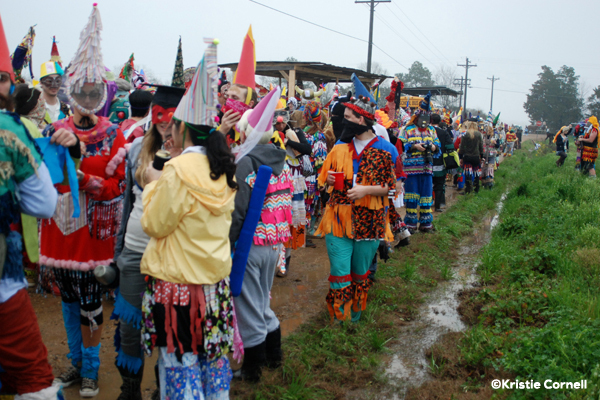 In Acadiana, a region surrounding Lafayette, many towns celebrate the ancient Carnival tradition of courirs, where costumed men and women on horseback and trucks travel the countryside to beg residents for ingredients to a gumbo, usually with a musical band and onlookers following behind. 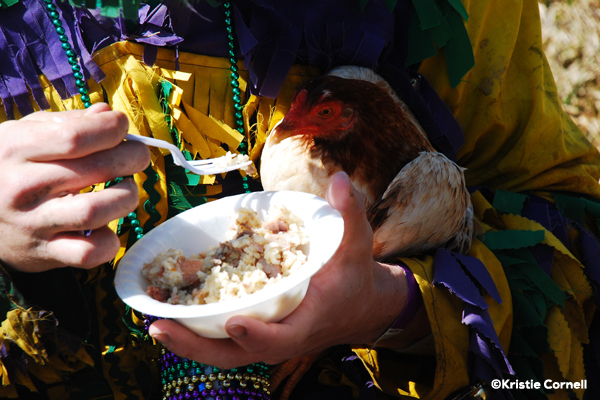 Once they arrive in town, a communal gumbo is cooked and enjoyed. 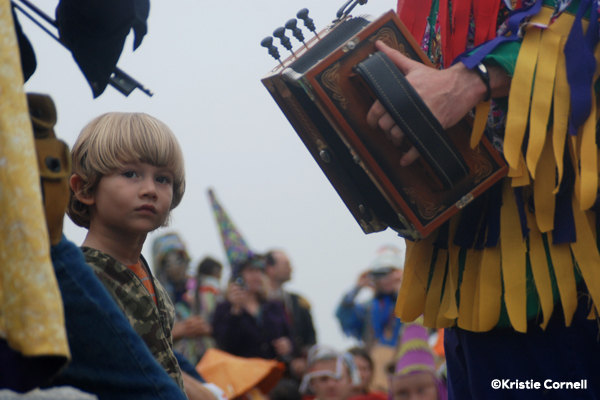 Les courirs de Mardi Gras are completely different from town celebrations. Lafayette, for instance, celebrates a Carnival more typical of New Orleans, with parades, balls and special events occurring within the city limits, culminating on Mardi Gras day. The Cajun courirs de Mardi Gras date back to medieval France where disguised revelers dressed in mocking costumes would visit homes on Mardi Gras day. Because times were hard for peasants, these masked revelers would perform skits and songs while they begged. 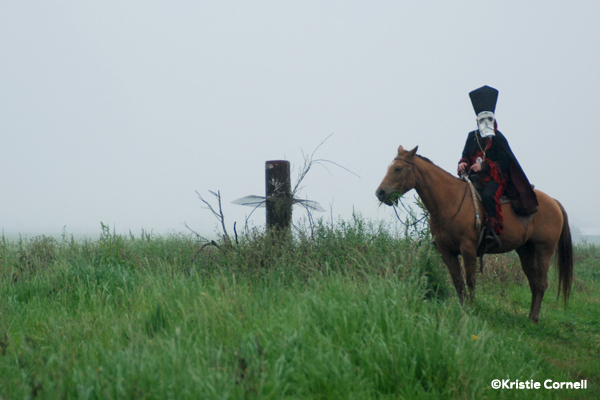 In South Louisiana today, a procession of masked or costumed participants leave town early in the morning most on Mardi Gras day and ride on horses, wagons and trucks, according to Barry Jean Ancelet, a folklorist and scholar who is now head of the University of Louisiana at Lafayette&apos;s Department of Modern Languages. The group is helmed by a capitaine who carries a flag, assisted by participants who explain the rules of the day. The group is dressed in costumes that mock officials, such as the pointed hat known as the capuchon that once poked fun at French royalty or mortarboards that mock the well educated. Some are all male, some all female, some mixed, Ancelet wrote in A Brief Overview of the Louisiana Cajun Country Mardi Gras. Their costumes reflect ancient as well as contemporary parodies. Conical hats reflect European and African influences; miters and mortarboards reflect a traditional scorn for medieval and contemporary institutions; venerable roles are preserved, such as contemporary versions of the French paillasse and the false bishop. 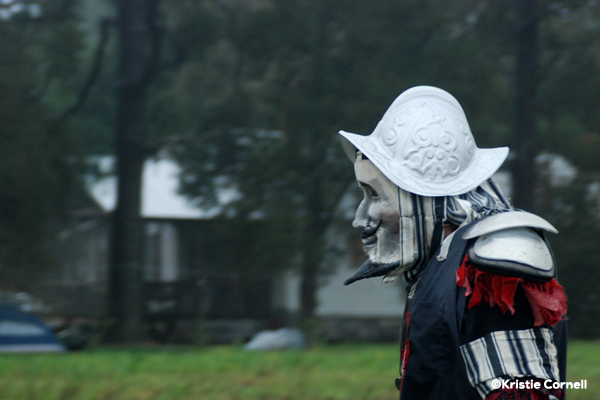 Some masks take on more modern characters, including political and popular culture figures. 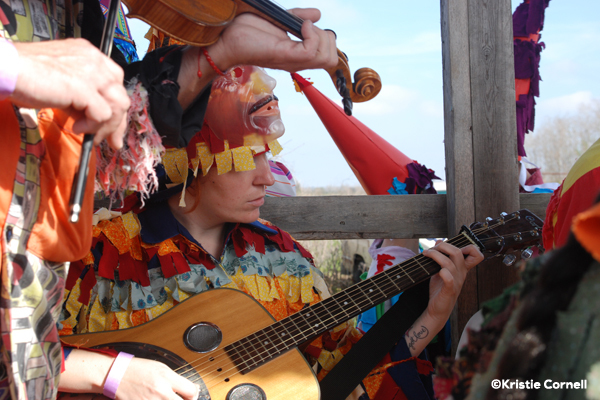 The group travels the countryside, visiting farms where they sing, dance and perform silly skits. 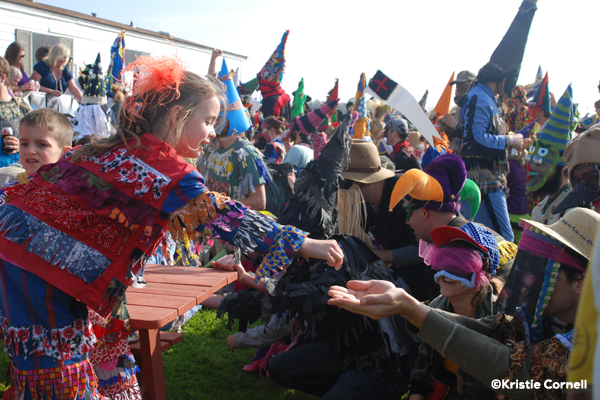 The traditional Le Danse de Mardi Gras or Mardi Gras Song is sung as well. 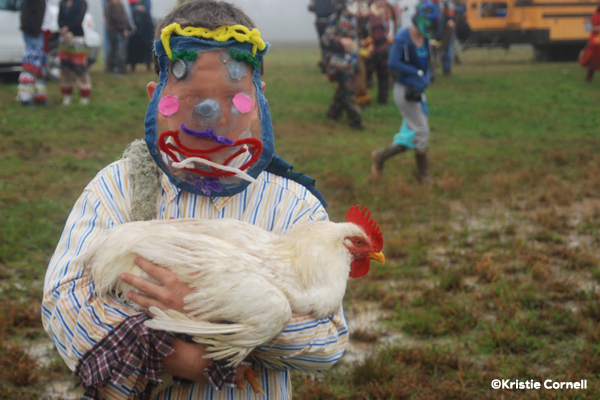 Farmers offer ingredients to the group for a communal gumbo, items such as rice, flour and sometimes live chickens, which the maskers attempt to catch as the chicken races around the farmyard. 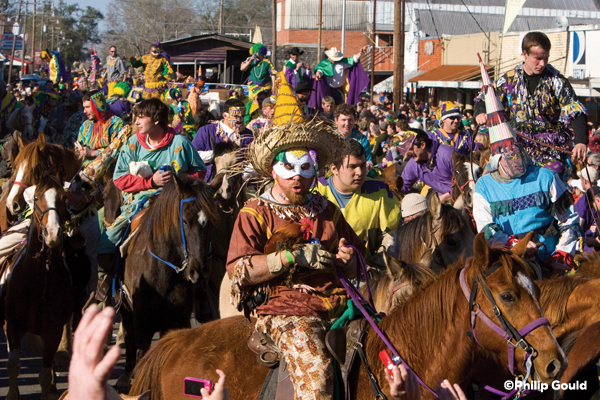 In the versions where horses are used as transportation, Mardi Gras provides the opportunity to display horsemanship, according to Ancelet. Riders race to the host house from the road when the capitaine waves his white flag to signal that permission to visit has been granted. During the visits, riders often dance while standing on their horses. Often live musicians or trucks projecting music on loud speakers will follow the courirs. In the case of those courirs open to tourists larger courirs such as in Eunice, Mamou and Church Point non-participants will follow along as well. After the run through the countryside the courir returns to town and cooks up a communal gumbo. In some cases, there is a parade or performance. The Tee Mamou courir in the southwestern Louisiana town of Iota, for instance, parades through town for the annual Mardi Gras Festival and later performs at D.I.s Cajun Restaurant. Iotas children and women&apos;s krewes also perform at D.I.s the week before Mardi Gras. For a complete list of Carnival courirs, parades, balls and other activities in Lafayette and surrounding cities, visit LafayetteTravel.com/MardiGras.